Talk of potential war is grabbing headlines with growing concerns over North Korea's nuclear program. 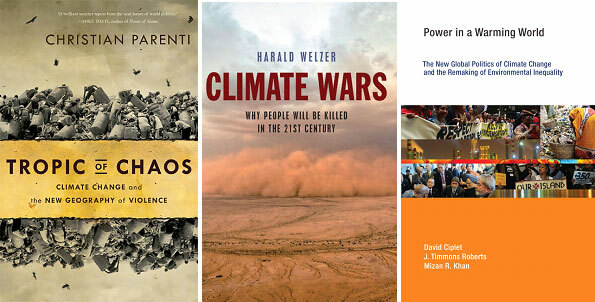 Talk of eventual 'climate wars' is on a far-different schedule, but some book authors say it's a question of when and not of whether. In early November, Americans honored the service and sacrifices their soldiers have made in foreign wars. Given the discussions at the climate meeting just concluded in Bonn, Americans may wonder whether they will soon find themselves honoring veterans of climate wars. 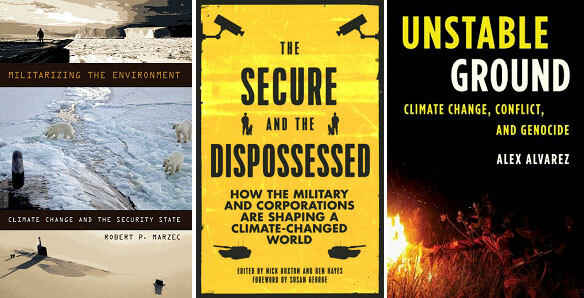 The authors of some of the works highlighted in this month’s bookshelf argue they already are: Lives and livelihoods have already been sacrificed in conflicts sparked or deepened by climate change. The descriptions of the nine books listed below, all released after 2007, have been drawn from copy provided by the publishers. A companion post highlights twelve freely downloadable reports published since 2015. Global climate change poses not only environmental hazards but profound risks to planetary peace and stability as well. Climatic Cataclysm gathers experts on climate science, oceanography, history, political science, foreign policy, and national security to take the measure of these risks. The contributors analyze the security implications of three scenarios – expected, severe, and catastrophic – for climate change, which at a minimum include increased disease proliferation, tensions caused by large-scale migration, and conflict sparked by resource scarcity, particularly in Africa. In the coming decade, the United States faces an ominous set of foreign policy and national security challenges. Global climate change will not only complicate these tasks, but as this sobering study reveals, it may also create new challenges that dwarf those of today. Dwindling resources. Massive population shifts. Natural disasters. 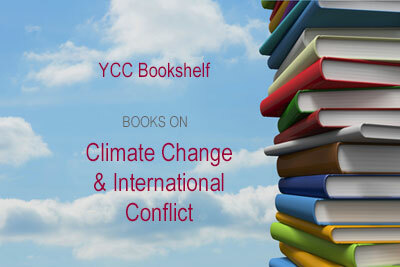 Any of the expected consequences of climate change could – as Gwynne Dyer argues in this galvanizing book – tip the world towards chaos and conflict. Based on exhaustive research and interviews with international experts, Climate Wars is an essential guide to the future of the planet. One of the world’s great geopolitical analysts, Gwynne Dyer has worked as a freelance journalist, columnist, author, broadcaster, and lecturer on international affairs for more than 20 years. His column is published around the world and is translated into more than a dozen languages. He is the author of War: The Lethal Custom, Future: Tense, and The Mess They Made. In a perfect storm, the environment, the global economic system and geopolitics are all undergoing rapid, uncontrolled change. In the same way that the climate is in a state of flux, exhibiting erratic behavior before settling into a new norm, in the wake of the global economic crisis, many of the assumptions about the Western economic system have been destroyed, which leads to some troubling questions: How aggressive will water-hungry China become in order to secure a sufficient supply of it? What will when India begins large-scale importing of shrinking food? In Global Warring, journalist and analyst Cleo Paskal examines the most likely scenarios and illuminates the ways in which they could radically alter human existence. In Tropic of Chaos, investigative journalist Christian Parenti travels along the belt of economically and politically battered postcolonial nations and war zones girding the planet’s mid-latitudes. Here he finds failed states amid climatic disasters. But he also reveals the unsettling presence of Western military forces and explains how they are preparing for open-ended global counterinsurgency. Parenti argues that this incipient “climate fascism” – a political hardening of wealthy states – is bound to fail. The struggling states of the developing world cannot be allowed to collapse. Instead, we must work to meet the challenge of climate-driven violence with a very different set of sustainable economic and development policies. In Power in a Warming World, David Ciplet, J. Timmons Roberts, and Mizan Khan, bring decades of combined experience as negotiators, researchers, and activists to bear on this urgent question: How did we arrive at an entirely inequitable and scientifically inadequate response to climate change? Combining rich empirical description with a political economic view of power relations, they document the struggles of states and social groups most vulnerable to a changing climate and describe the emergence of new political coalitions that take climate politics beyond a simple North-South divide. A focus on incremental market-based reform, they argue, has proven insufficient for challenging the enduring power of fossil fuel interests, and will continue to be inadequate without a bolder, more inclusive and aggressive response. In this extensive historical study of scientific, military, political, and economic formations across five centuries, Robert P. Marzec reveals how environmentality has been instrumental in the development of today’s security society – informing the creation of the military-industrial complex during World War II and the National Security Act that established the CIA during the Cold War. He then shows how ideas of coexisting with the planet are being replaced by a militarized vision of adaptation. While the world’s scientists and many of its inhabitants despair at the unfolding impacts of climate change, corporate and military leaders see nothing but challenges and opportunities. For them, melting ice caps mean newly accessible fossil fuels, borders to be secured from “climate refugees,” social conflicts to be managed, and more failed states in which to intervene. With one eye on the scientific evidence and the other on their global assets and supply chains, powerful elites are giving increasing thought as to how to maintain control in a world gradually reshaped by climactic extremes. The Secure and the Dispossessed looks at these deadly approaches with a highly critical eye. Adaptation and resilience to a climate-changed world is desperately needed, but the form it will take will affect all of our futures. Unstable Ground looks at the human impact of climate change and its potential to provoke some of the most troubling crimes against humanity – ethnic conflict, war, and genocide. Alex Alvarez provides an essential overview of what science has shown to be true about climate change and examines how our warming world will challenge and stress societies and heighten the risk of mass violence. Drawing on a number of recent and historic examples, including Darfur, Syria, and the current migration crisis, this book illustrates the thorny intersections of climate change and violence. As research suggests climate change will continue and accelerate, understanding how it might contribute to violence is essential in understanding how to prevent it.